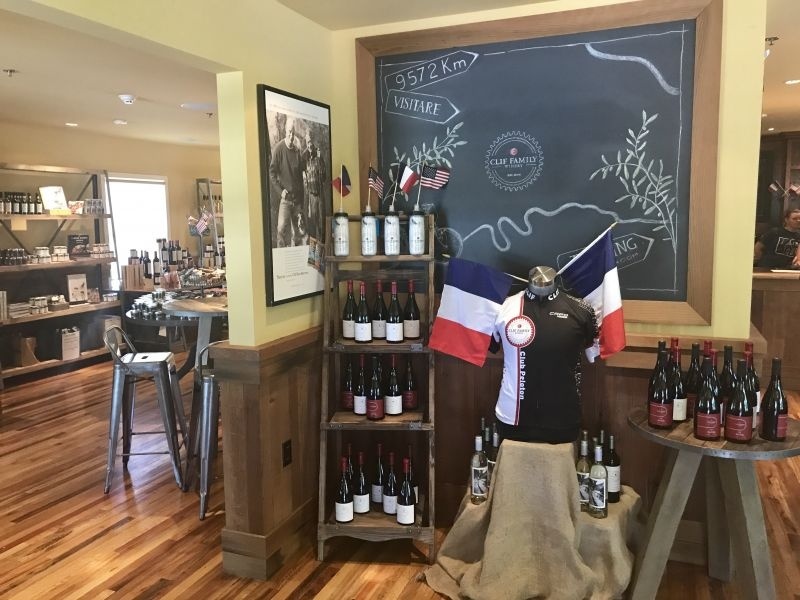 Driving south out of St Helena on Highway 29 you pass several tasting rooms. 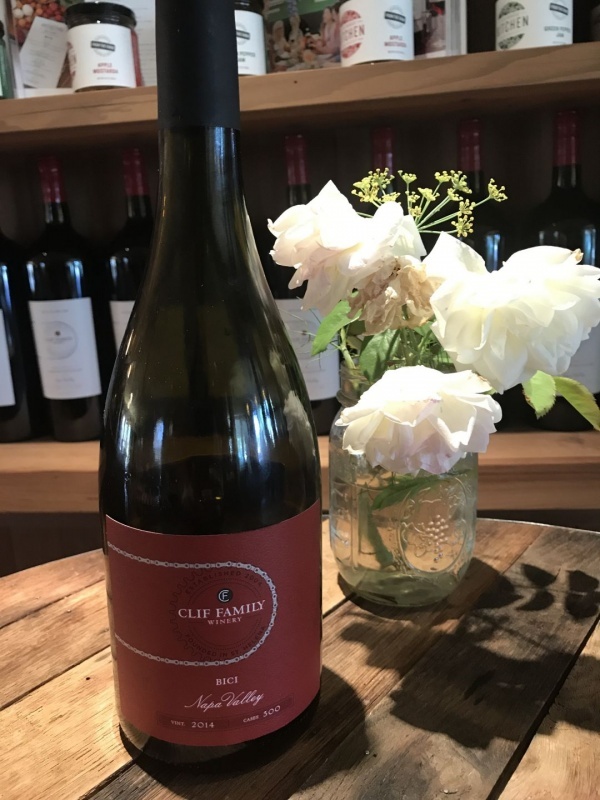 On a recent trip to Napa Valley, we decided to visit one of these establishments; Clif Family Winery. That is the correct spelling of the name; just like the health bar. 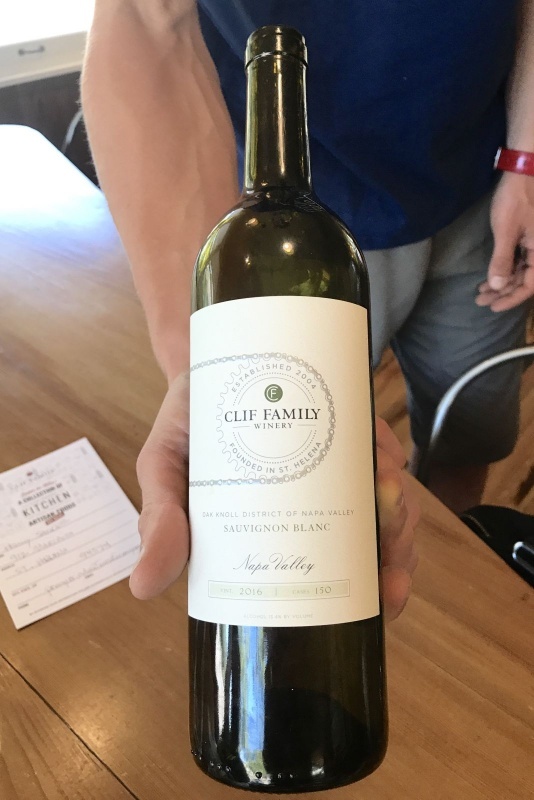 That spelling is not a coincidence, the winery was founded and is owned by Gary Erickson who created the Clif Bar. 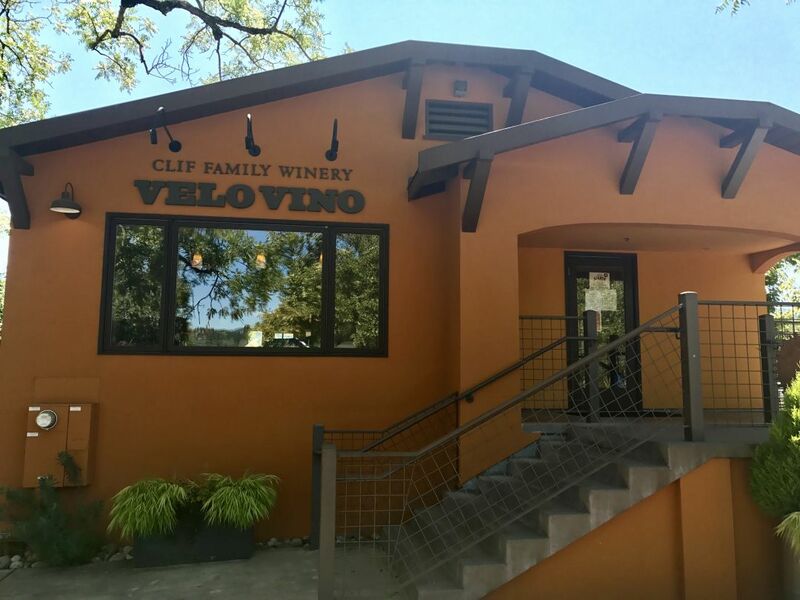 The tasting room is painted a burnt umber, with a sign on the building that reads “Velo Vino”. The name reflecting Gary’s fascination with cycling and wine. It was this former passion that provided the inspiration for the creation of the Clif Bar. There is a bicycle rack made from wine barrel staves outside. The interior of the facility is decorated with cycling equipment and photographs. The labels of the Clif Family wines show either photographs of cycling or a logo of a sprocket and chain. There are two options for tasting: King of the Mountain ($40) and Yellow Jersey ($30); both references to the Tour De France. 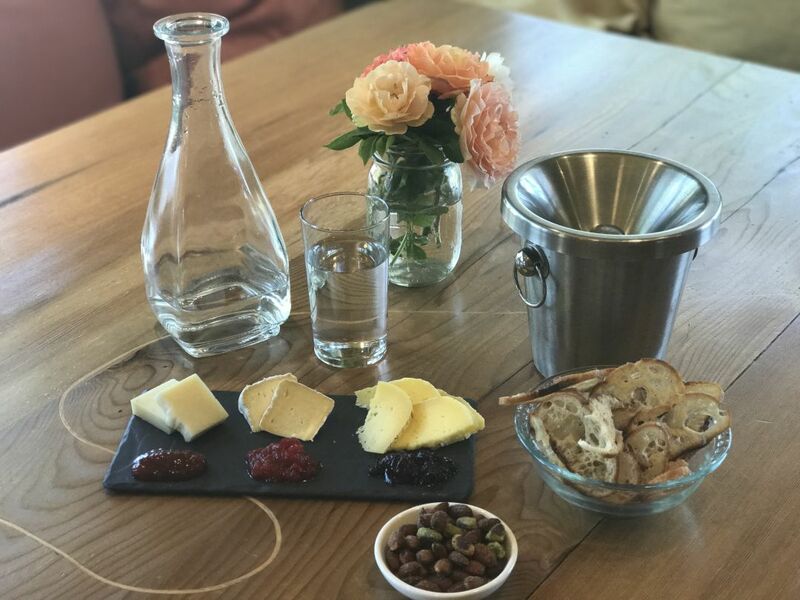 In addition to tasting flights, there are food pairing options, wine by the glass, coffee, and lunch options provided by the Clif Family Bruschetteria food truck Tuesday through Sunday. Many of the ingredients from the truck are grown on the Clif Family farm, which is certified organic as are the vineyards that Gary and Kit Erickson own. California Girl and I were accompanied by Penny from Adventures of a Carry-On blog. Our host for this tasting experience was Tom, who impressed with his knowledge and enthusiasm. California Girl comments: This entire experience really wowed us all. We loved the hospitality, Tom’s knowledge, and the wines. The tasting room has a terrific “vibe” to it. It is somewhere I would be happy to go and hang out like a wine bar. The word Outstanding and Hidden Treasure comes to mind. I also had the opportunity, earlier in the week, to eat at their food truck which serves gourmet bruschetta and it was fantastic! A truly unique and lighter lunch; perfect for something unpretentious and fun. Tom brought a trio of cheeses on a slate. 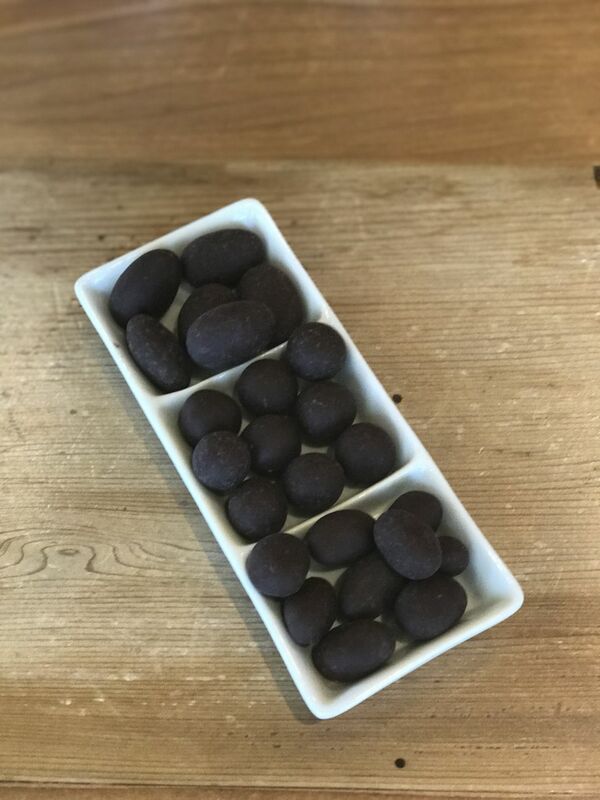 There was a sheep’s milk cheese called Lamb Chopper, Mt Tam, and Bellwether Farms Carmody; the last of these made from Jersey cow’s milk. Each cheese came with a preserve made from fruit and vegetables grown at the Clif farm outside Angwin. California Girl comments: The cheeses were not the only pairing that day. We were treated to a variety of Clif Family home made nuts, jams, chocolates, and the actual Clif bars. I thought it was extremely interesting how Tom paired each wine with the bites of food and was so impressed with the quality of each and every thing we ate. It was the perfect complement to everything else. We even purchased some of the jam. It was outstanding. The first wine was the 2016 Reserve Sauvignon Blanc, made from fruit grown in the Oak Knoll district of Napa Valley. It has been 75% fermented in neutral French oak barrels. The nose was ripe with tropical fruit, with distinct notes of mango. There was a creaminess in the mouthfeel, with a delightful moderate citrus acidity, and a hint of guava. This was an excellent Sauvignon Blanc that impressed all three of us. It sells for $38. California Girl comments: I absolutely loved this wine. Without going into techno wine speak – it was DELICIOUS. That is a white wine that I could go back to time and time again without ever getting sick of it. Next up was the 2016 Route Blanc Sauvignon Blanc ($28). The name is another cycling reference. The wine is a mirror image of the earlier one; having been 75% fermented in stainless steel. The grapes were from the Amendola vineyard, which is just across the road from the tasting room. The nose was sharper: lemon and pear. Taking a sip, I was struck by notably higher acidity and a crisp lemon tang. I think that it would have been fairer to open with this sip, as it is a simpler, less robust wine than the Reserve. California Girl Comments: I liked this wine, and had I not been so overwhelmed with the first SB, I would have talked about this in glowing terms. There was none of that grass in the mouth nor too much grapefruit; just cool and refreshing. It would be a delight to serve this wine with so many dishes. A really worthy wine indeed. 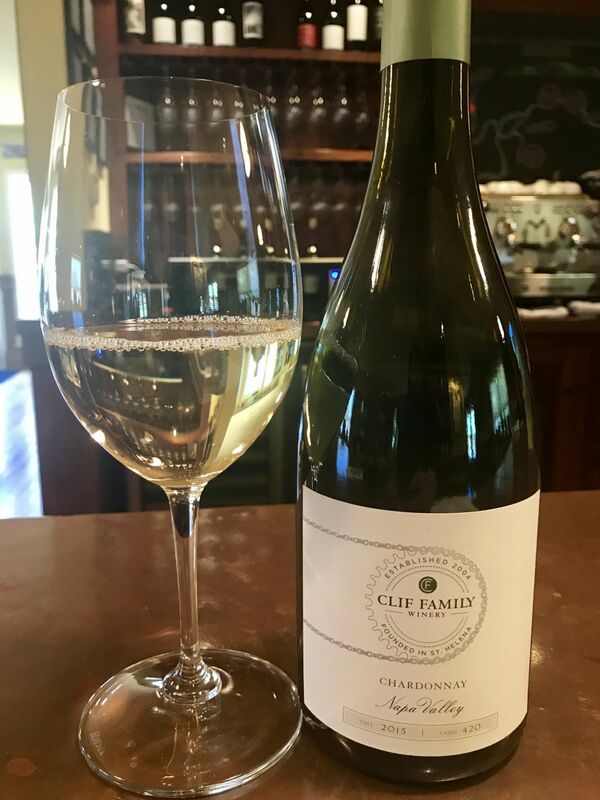 We continued to enjoy Clif Family white wines with the 2015 Chardonnay, with grapes grown in Oak Knoll. The Chard had spent time in neutral French Oak. It sells for $42 a bottle. The nose was challenging in its complexity; I found apple, pineapple, and pepper. The mouthfeel was soft, but not creamy. There was a refreshing crispness, that avoided being overly acidic. There were flavours of pear, pepper, and vanilla. The last of these elements was subtle and not overpowering. This Chardonnay is another example of a pleasing trend away from oaky and buttery wines. I liked it, but not unlike several other wines I tasted here, did not love it. 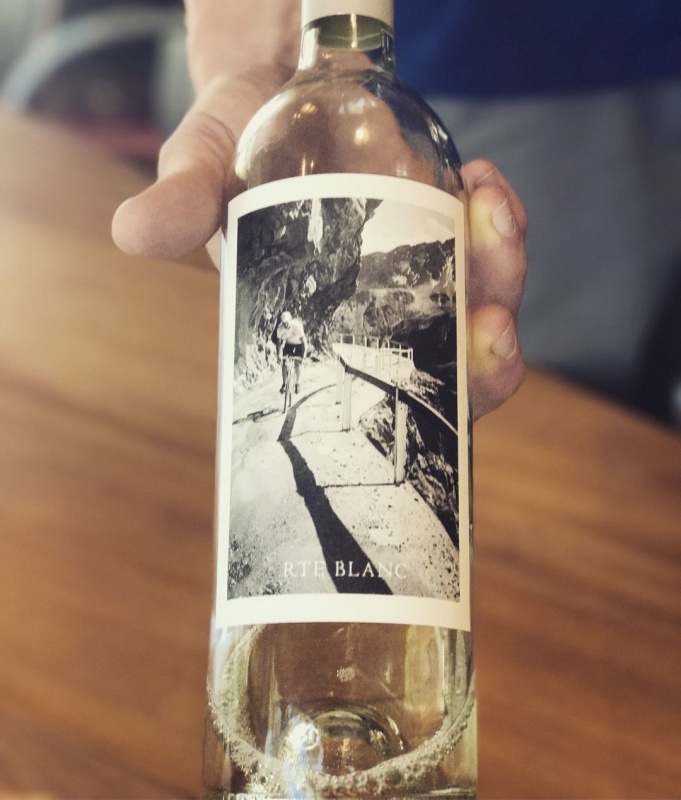 California Girl Comments: At my little sneak visit earlier in the week to Clif Family and their Bruschetta truck, I had a glass of this Chardonnay. It is a nice sip and I really enjoyed it. If given the choice, however, I would choose the first Sauvignon Blanc in the future. Next up was the 2016 Viognier, a blend of fruit from two different vineyards. The nose was an intense punch of honey and rose; leading me to expect a sweeter wine. What I actually tasted was a medium plus acidity wine with apple and honeysuckle and a finish that excited the tongue with a spicy mix of cumin and pepper. California Girl comments: This one was my least favorite sip of the day. I don’t know, it just didn’t lay on my palate in a pleasing way. Before we moved to red wine Tom gave us a taste of the 2016 Rosé of Grenache. This seemed a little unfair. They no longer had bottles to sell, but it can still be ordered by the glass. Five-hundred cases were made and then sold inside seven weeks from its release on February 14. The colour of the rose was extremely pale. The nose subtle as was the flavour with notes of strawberry and lemon. A refreshing summer sip. The first red was the 2015 Mendocino Grenache ($35). The wine was a pale red in colour. Served slightly chilled it had a nose of figs and straw. Taking a sip revealed a wine of low acidity, low to medium tannins and light plum flavours. The finish offered a spicy kick. A red wine that can be enjoyed on the patio on a warm summer’s day. I loved this wine; California Girl was less impressed. The lightness of the wine disguises a fairly meaty 14.8% ABV. 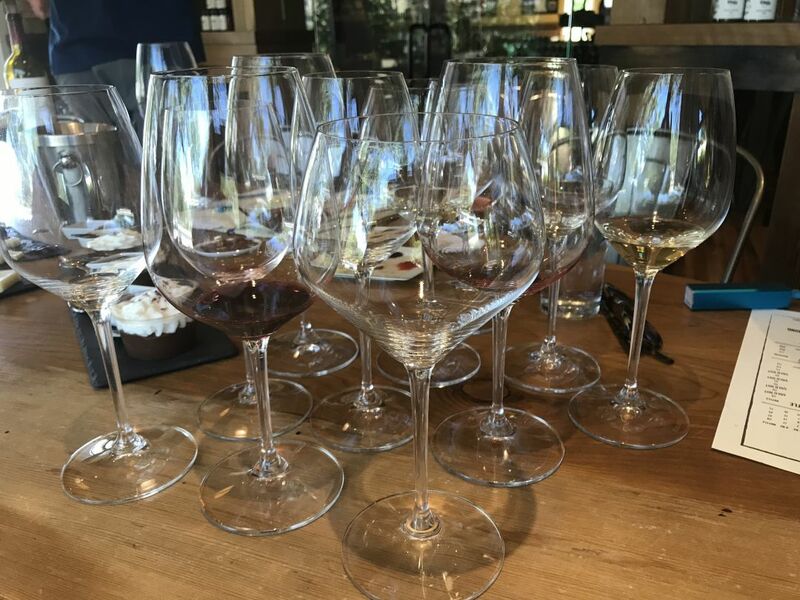 All of these wines were the creation of Laura Barrett, the winemaker for Clif family since 2014. Her first vintage in the lead role was 2015. The first of the pre-Laura wines was the 2014 Bici Red, which sells for $42. A Rhône style blend of Syrah, Grenache, Petite Sirah, and Cinsault. The nose reeked of ripe plum. Taking a sip revealed a soft spicy mix of fruit and butter, with distinct notes of raspberry. We loved this wine and purchased a bottle, along with two of the Reserve Sauvignon Blanc. California Girl comments: What a nice, easy to drink and affordably priced wine. It was a favorite sip of the night. We finished with a couple of different Cabernet Sauvignon. Both were 100% Cab. 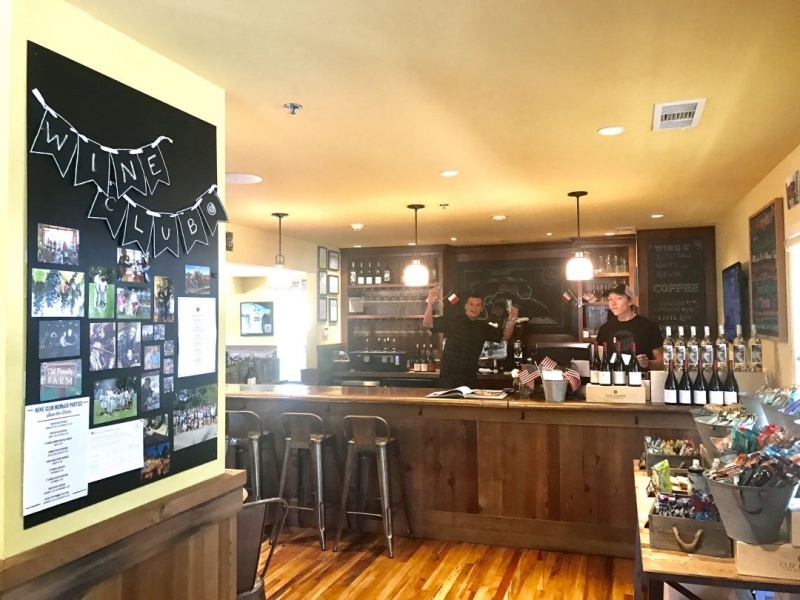 The first was Kit’s Killer Cabernet Sauvignon, a blend of wines made from fruit grown on two vineyards on Howell Moutain: Cold Spring Estates and Croquet Vineyard. These sit 1600 and 1700 feet above sea level respectively. In addition to the altitude difference, the two sites have distinct solid types: volcanic ash and clay. The blend was from 2011, a vintage that was not kind to Napa Valley Cabernet. This wine, however, was excellent in its own right and truly outstanding given the year of its birth. There were plum and licorice on the nose. The wine was velvety soft as I sipped it, with well-behaved tannins and rich fruit that combined plum and blackberry. The wine sells for $75 and is drinking better than several $100+ Cabs that I have tasted recently. California Girl comments: I have to agree, they are doing things right over there. Their wines are very approachable and easy to drink. I can see them appealing to just about every palate. 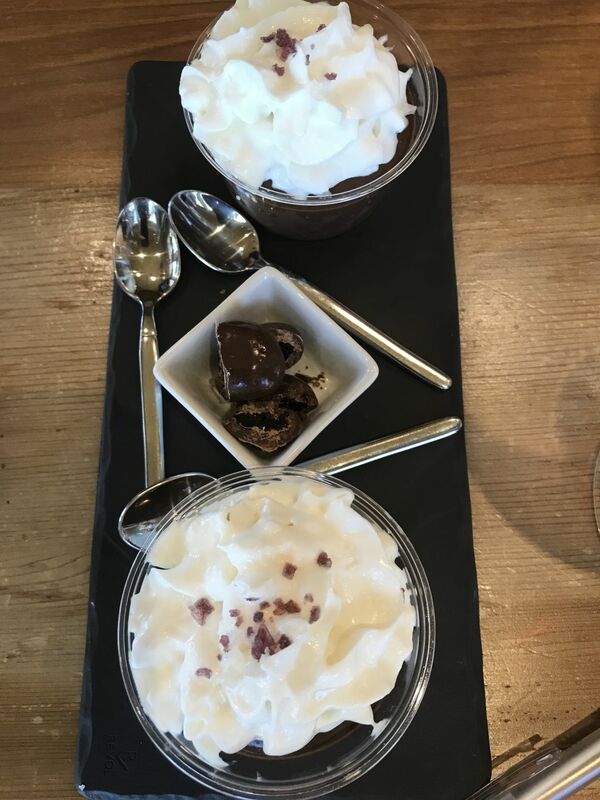 They even gave us dessert and chocolate to pair with our wines! I am in love love love! The 2012 Cold Springs Howell Mountain Cabernet Sauvignon was a fitting finale. An intense nose of ripe plum, raspberry, pepper, and bacon led to a soft mouthfeel with tongue tingling tannins and raspberry notes still in the background of this youthful wine. This wine sells for $125. California Girl Comments: Both Cabs were extremely delicious. I was impressed with how ready to drink they both were considering their relative youth. Both will age, but if you are going to cellar something, I would suggest you do so with the Cold Springs Howell Mountain Cab. This will just mature and ripen beautifully over the years. Throughout the tasting Tom used the appropriate glass for the wine, not going as far as Miner family in offering a new glass for each wine, but using enough glasses to allow side by side tasting of wines. The airy tasting room, a bar, and a patio provide options for sitting. The aforementioned food and wine by the glass mark this as a different experience from most Napa tasting rooms. 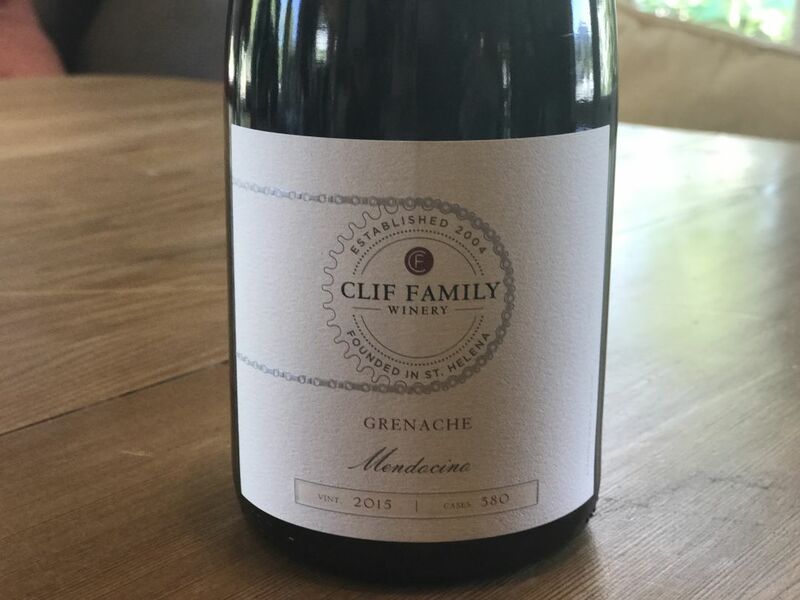 Finally, the Clif family wine list offers excellent full-bodied Napa red wines, but also a wide range of interesting white and more subtle red wines. 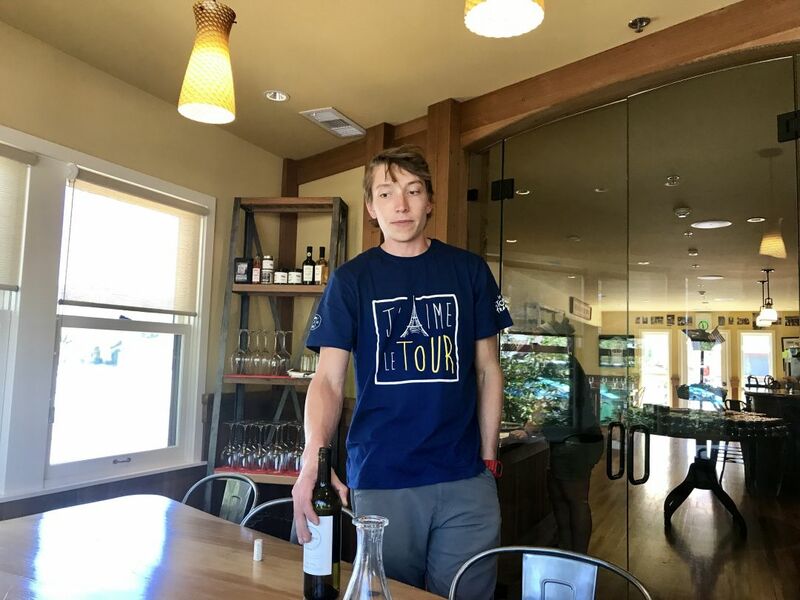 There are, without a doubt, more picturesque tasting rooms along Highway 29, but few that offer so much diversity. We highly recommend a visit; we are certainly keen to return. 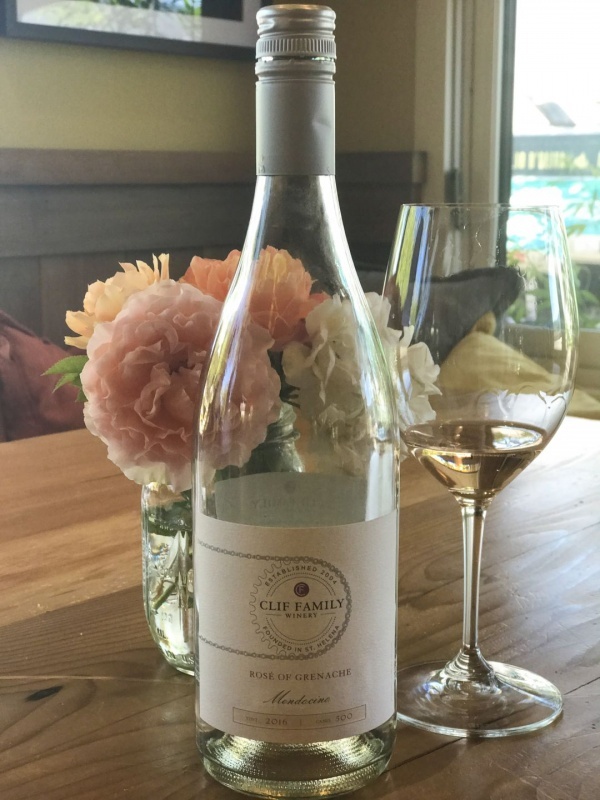 California Girl Comments: Clif Family Wines combines gracious hospitality, value for money, and a great experience. This is a highly recommended tasting room that we will visit again and again. They had better watch out, if they keep treating us like this, we might move in! Lori, come to Napa… we will go together! All it took was a fantastic visit at Clif Family for us to join their wine club. And we haven’t been disappointed yet! We’ve been to several wineries and this was the first winery that we joined their club. Believe me Piper, it’s not far from our minds. We have big love for them! Totally worth it! It makes their already affordable wines even more affordable…and even harder to resist stocking your wine rack with entirely just Clif wine!